When I was little there was nothing I loved more than exploring around the family farm of my childhood; on my pony, far off the beaten track, it didn’t really matter where I went. But an unknown lane or a tiny path I had not previously seen meant one thing and one thing only to my inquisitive mind; where would I end up? And when my grandparents came to stay, they would always take my sister and I out for a drive in my grandfather’s pride and joy, his beautiful vintage Rover. Back in those days in England, it was the era of the Sunday afternoon drive, a bone of contention for anyone local and in a hurry for Sunday afternoon drivers slowly cruised along, always looking this way and that with little regard for other traffic. We would join this group playing our favourite game, ‘Left or Right’; at each junction we came to we took it in turns to call which way to go and my grandfather would duly oblige. Frequently we had no idea where we would end up but that was what made it so special, not knowing what we would come across around the next corner. Earlier this week, my husband and I did just the same one morning. Having deliberately cleared our desks the night before, we quickly grabbed a cup of coffee and our cameras and jumped in the car on a little exploratory trip after dropping the children off at school. 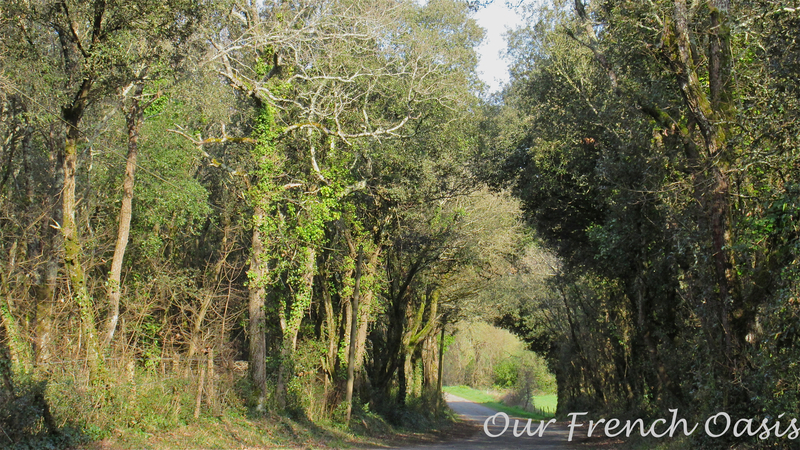 We truly didn’t know where we were going as we headed off into the country, beetling down tiny narrow lanes we had never driven before. 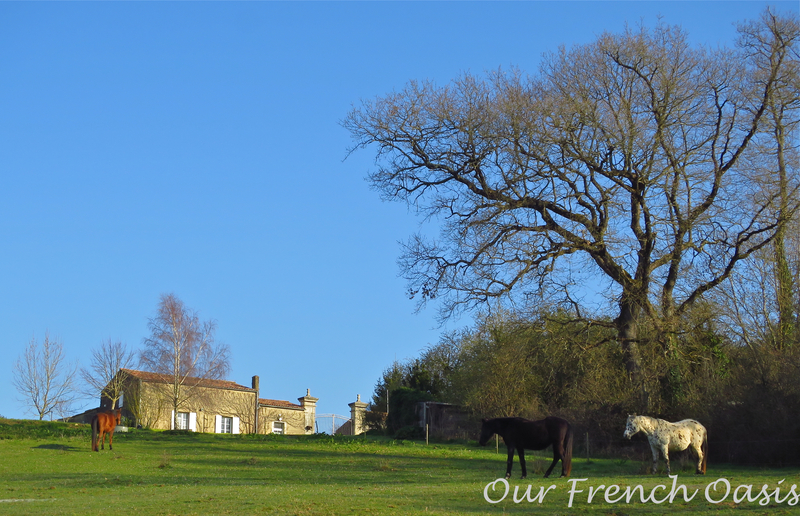 All we knew was that the sky was the most perfect blue, the sun was shining and it was a beautiful early spring day; this post is about some of the places we discovered all within half an hour of our house! 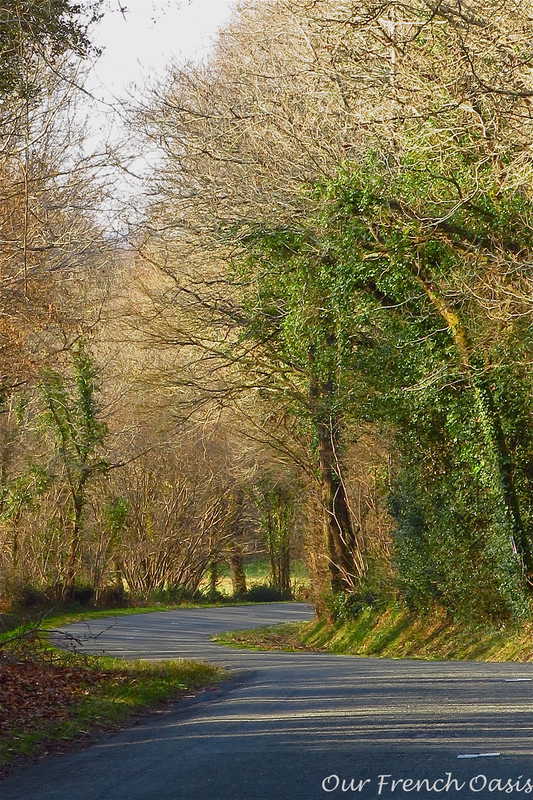 The roads got smaller and we found tiny hamlets we never knew existed; we came upon villages that we had previously seen signposted but we had never visited. 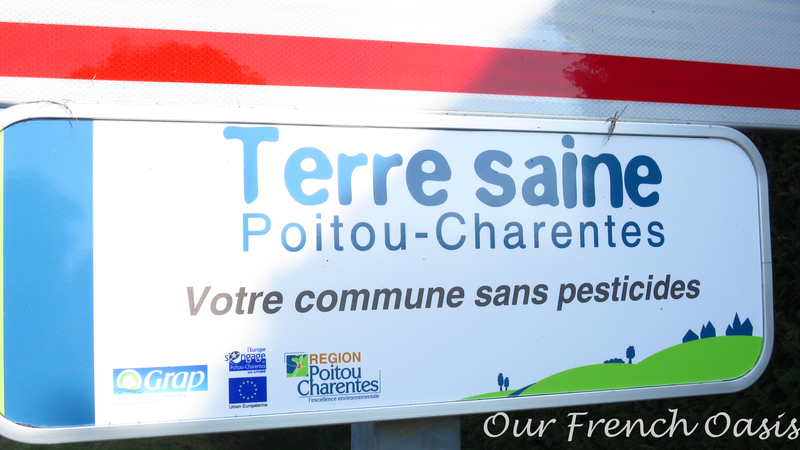 On our travels, we came across the most fascinating sign below, proudly announcing the entrance to a village without pesticides. We had never seen such a sign and it more than peaked our interest. As we’re really not fond of the use of pesticides and chemicals ourselves we wanted to know more. 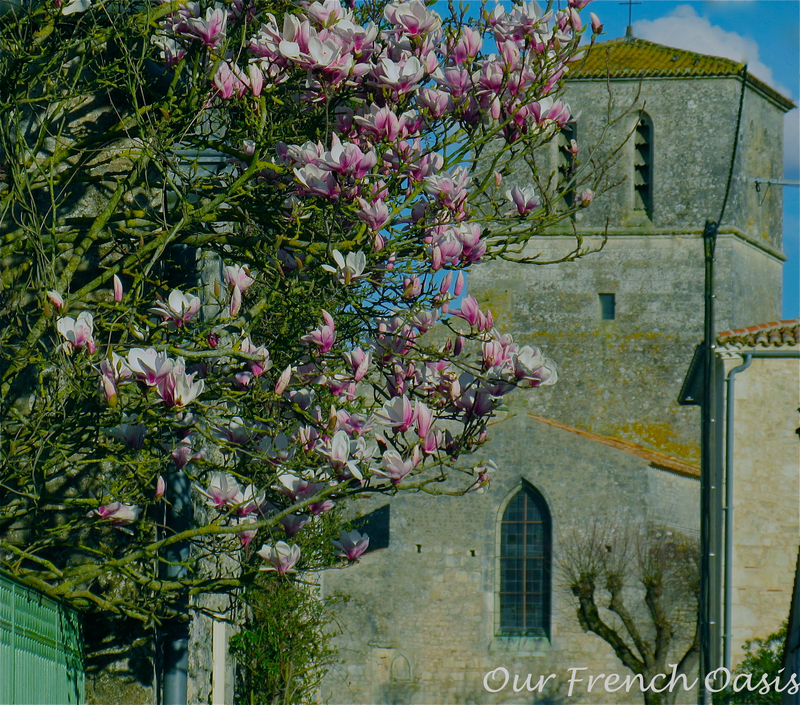 Now, what many of you may not know is that every town and village in France has a Mayor (or Mayoress), even if sometimes the Mayor is in charge of two small villages close together. And in each village, the local Mairie will be open for a few hours a day; even if the Mayor himself is not there, the Mayor’s assistant will be, and they are always a fountain of all knowledge. So, having seen this sign, we found the village’s Mairie and went inside to find out exactly what this meant. we spied a ruin in the distance which led us even deeper into the unknown as we tried to find it. When we finally tracked down the crumbling edifice we found a small information board that let us know that this was ‘La Tour de Broue’. 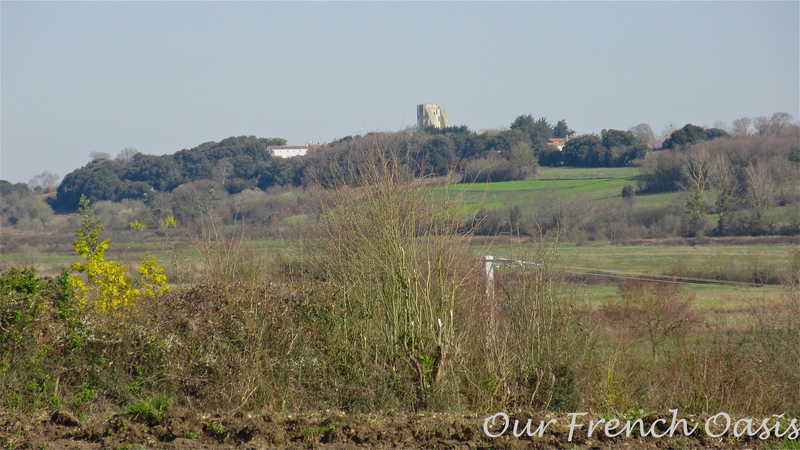 The tower pictured is all that is left of an ancient 11th century fort, situated 27 meters high on a hill that once had the Golfe de Brouage lapping saltwater at its feet each high tide. 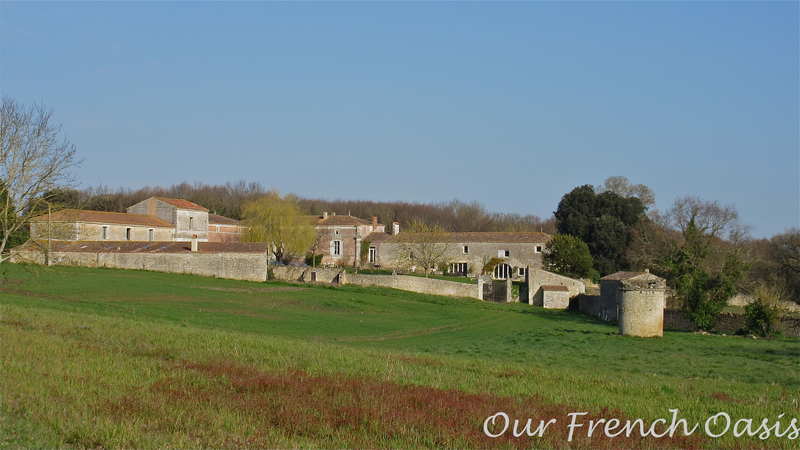 Designed to give protection and strength to the workers in the fledgling salt industry of that time, it was abandoned in the 18th century as the sea retreated, forming the final part of the vast complex of marais – the marshlands that are a part of the Charente-Maritime’s rich history. 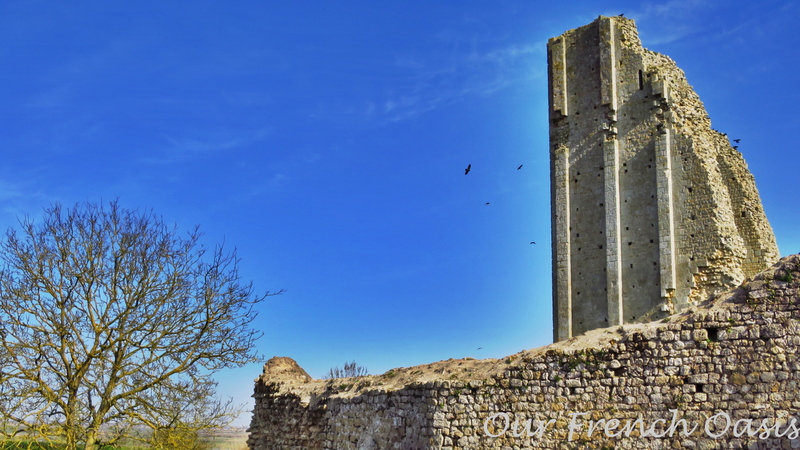 Today only a scattering of ravens haunt it’s lonely ruins, a grim reminder perhaps of when death and desolation was part and parcel for the inhabitants of this rough but stunning countryside. I hope you have enjoyed exploring with me and have a fabulous week. Beautiful photographs of glorious countryside! Thank you. Magnificent magnolias, spring is on it,s way. Bon Jour! How beautiful! 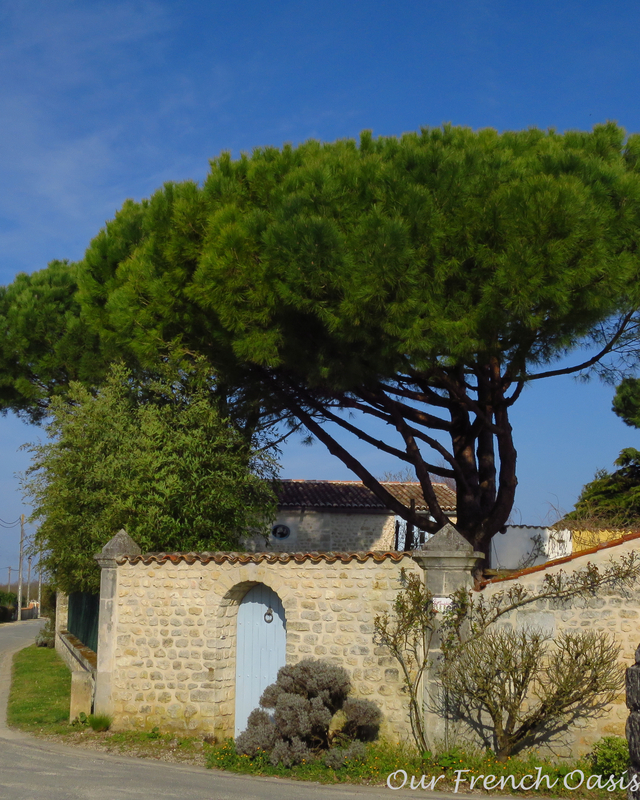 The vision of “Terre Sainte” is truly heavenly. What a wonderful idea! 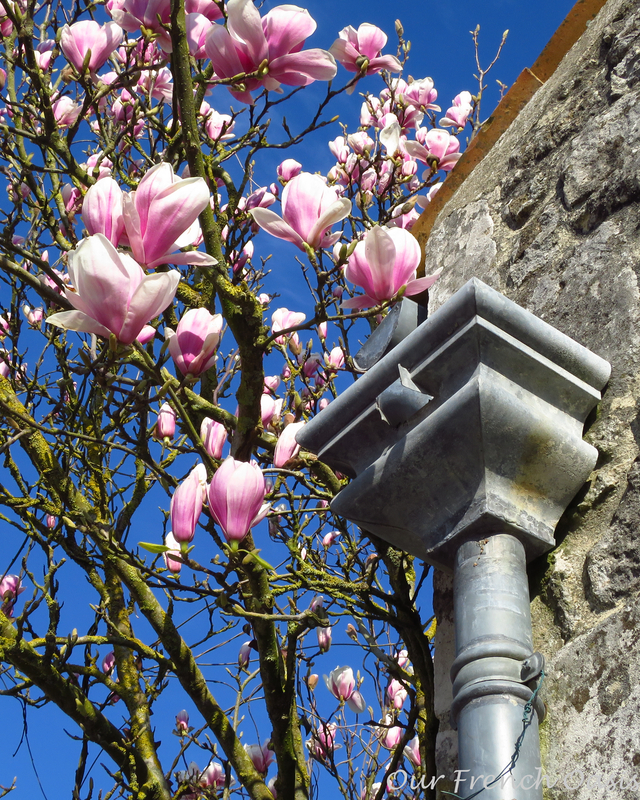 We had a tulip magnolia like those in the photos in front of my childhood home in West Virginia, USA. What a wonderful memory the photos brought to me this morning. Thank you for sharing! I love the idea of a pesticide free area! 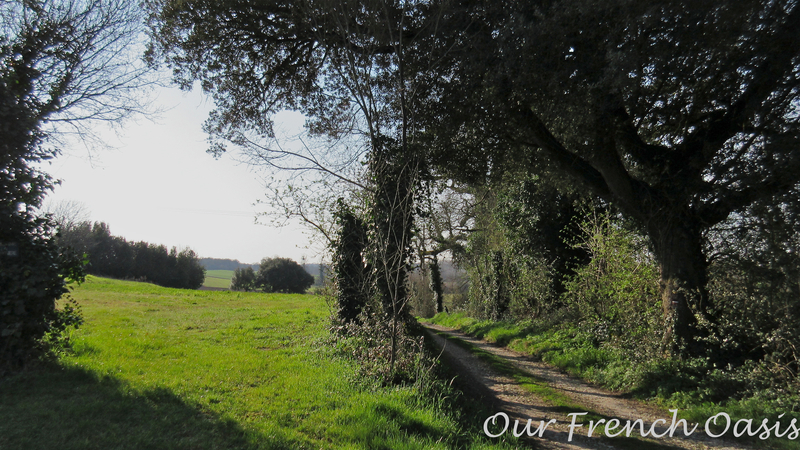 We live right in the middle of agricultural country in the Rhone Basin and it scares me to think about how much of those pesticides that we are breathing in! Indeed nothing beats wandering in new places! I know just what you mean about pesticides, we nearly bought a house next to a field of sunflowers, but turned it down partly because of all the spraying that I just knew would end up in our garden. We are going to push for our own village to become pesticide free, it is such a brilliant idea, I have never seen such a thing before. Hi, yes our trees are all quite well advanced here, the wisteria has big buds on it now, the peach trees are now in blossom and the cherry not far behind. However, today is cold, the weather is so up and down in March. 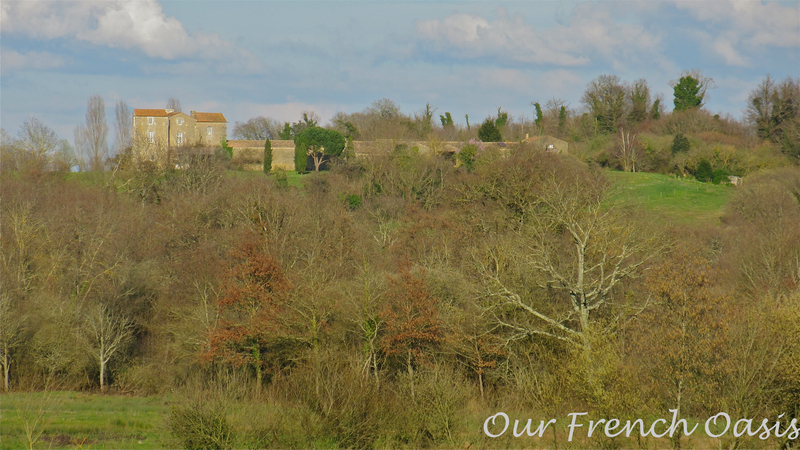 I had never heard of a pesticide free area, I wonder if it is anywhere else in France, have you heard of such a thing in Normandy? Thank you for sharing. Very interesting and beautiful pictures.